A wonderful Springtime meal! Quick enough for a weeknight, delicious enough for a dinner party! 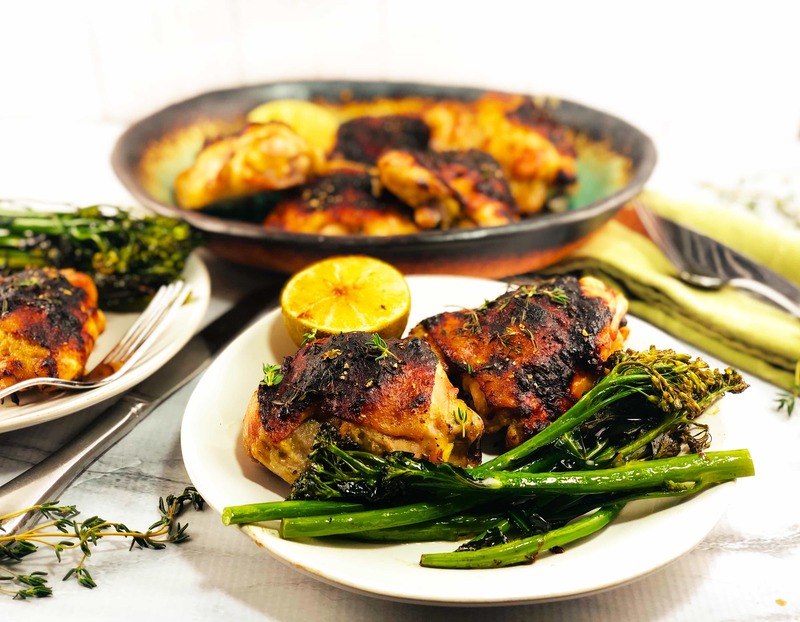 Succulent Chicken Thighs basted with rhubarb butter are roasted along with Broccolini (or thin asparagus) to create a super-flavorful meal. Serve with bread, or add a few chopped potatoes to the pan to cook along with the chicken and veg! 1/2 c (1 Stick) Butter, ROOM TEMP. Preheat oven to 400F (standard), or 385F (fan/convection). Spray 12×17 (or similar) sheetpan with cooking spray or brush with oil. In a small saucepan (2 qt), heat the rhubarb, orange juice, and honey to a simmer. Simmer until rhubarb is softened, about 6-8 minutes. Strain the softened rhubarb over a bowl, and reserve the pink liquid. You will use it to baste the chicken. Set the rhubarb chunks to cool a bit. When cooled, using a fork, mix the softened rhubarb with the butter, until all of the butter is smoothly incorporated. Salt (1/4 t) and Pepper (Big pinch) the butter. Gently loosen the skin over each thigh. Using a teapoon, place a spoonful of the rhubarb butter between the skin and flesh and rub it around a bit. It’s ok to rub a bit on the bottom of each thigh as well. Pat the tops of the thighs dry with a paper towel. Place each on the sheetpan, covering about 2/3 of the sheetpan. Salt and pepper each thigh, then brush the tops of the thighs with 1 Tablespoon (total) Olive oil. Then brush with the reserved Rhubarb liquid. Place in preheated oven. Roast 30 minutes. Remove from oven. Toss Broccolini spears with 1 T olive oil. Salt and Pepper generously. Cut limes in half. Add to the section of the sheetpan that is still empty. Place limes, flesh side down, onto the pan as well. Return pan to oven for 15 more minutes. When done, remove pan from oven, let rest 5 minutes, then remove and serve, squeezing lime juice over everything. Feel free to substitute Bone-in, Skin-on Chicken Breasts, if you prefer, for the thighs, just be careful not to over-cook. You may want to check for doneness at 35-40 minutes total. Internal temp should be 165F.